Produktinformationen "Kustoms Illustrated Issue #51"
This issue includes coast to coast coverage starting with Slim’s Kustom Invitational in New Jersey as well as the Cruisin’ Nationals in California. These events were loaded with cool customs and we have extensive coverage of both shows. 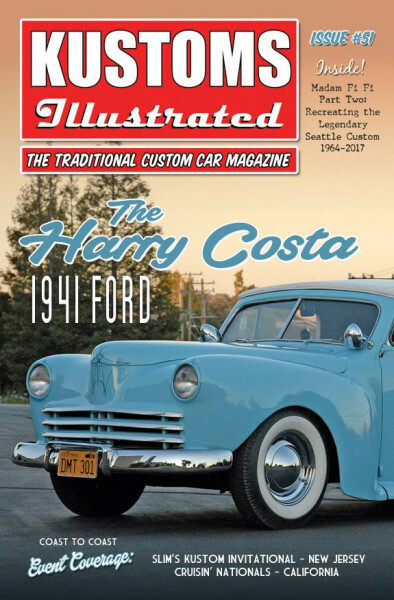 The cover car is the historic Harry Costa ’41 Ford convertible that is currently being cared for by Marcus Edell. This feature gives the history of this incredible survivor custom from the Bay Area that remains virtually untouched and still sports its original C.A. Hall Auto Tops padded and removable top. Although Costa’s Ford has been around for 60+ years and featured in many magazines, this will be its first ALL COLOR feature! Also in this issue is the amazing ’36 Ford roadster built by the crew at Altissimo Restoration in Northern California. Brandon Penserini created an elegant custom straight out of the early days of customizing. Wait till you see this beauty! Next up is the recently freshened-up ’49 Ford coupe owned by Lee Pratt. Although Lee’s shoebox has been around for over a decade, fresh paint and a color change give it a whole new look. Rik Hoving and Tom Neilsen give us Part Two of the wild and radical “Madam Fi Fi” ’56 Chevrolet clone being built in Seattle, Washington, and Rob Radcliffe wraps up his article on “How to achieve the Traditional Look” on a beautiful ’51 Mercury. Another “got-to-have” issue from the only all-custom magazine! Weiterführende Links zu "Kustoms Illustrated Issue #51"
Kundenbewertungen für "Kustoms Illustrated Issue #51"